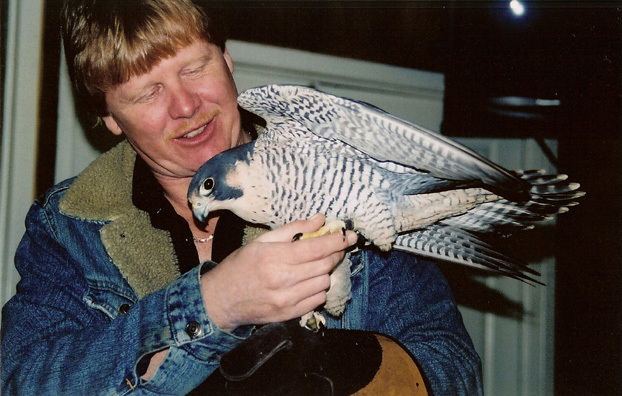 December 2004 -- Nick-named "T-fal" among many other things, this is the peregrine that never fledged - literally! She would rather walk than fly (even for food)!! Goofy as always, Falon and Mark take a moment for some play time at the CPF Raptor Centre. While she is just as comfortable on the couch, "laying down" watching TV with her human family, she is finally starting to grow up (well, sort of). Almost a full adult, she is still more interested in playing than adult peregrine stuff! Very odd, but delightful to be with. Some call her the "parrot-grine".